In a heartbreaking video released by Created Equal, Amanda, the mother of premature twin boys Emery and Elliot, can be heard pleading for her sons’ lives. In June of 2017, Amanda was experiencing bleeding when she went to Riverside Methodist Hospital in Columbus, Ohio, at 22 weeks and two days gestation. She said medical staff informed her that if her babies were born before 22 weeks and five days gestation, they would not resuscitate them. 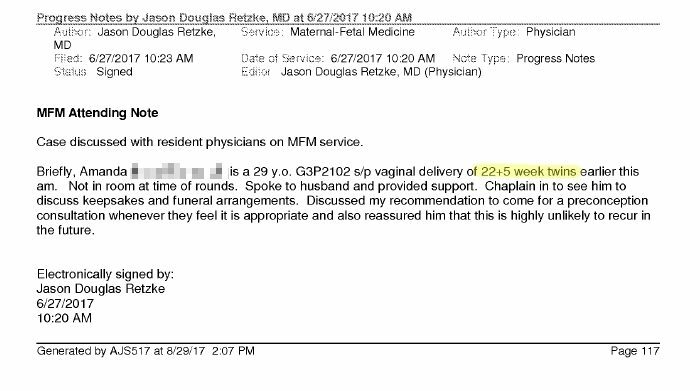 Three days later, at exactly 22 weeks and five days gestation as is confirmed by the attending physician’s notes, Amanda gave birth to Emery and Elliot, and though the boys moved, breathed, and even cried, she said the doctors still refused to help them. The attending doctor’s notes regarding the births of Emery and Elliot. For 45 minutes Emery moved, breathed and lived outside the womb before he died. A couple of hours later, Elliot was born. He was larger than Emery and lived for over two hours outside the womb – breathing, moving, and crying. Yet medical staff still did nothing to help him. A study in the New England Journal of Medicine states that premature babies born at 22 weeks are much more likely to survive with medical intervention than previously believed. In fact, babies like Emery and Elliot are continually surviving and thriving outside the womb. Babies born even earlier than the twins have survived when doctors cared enough to step in and help them. Baby Benson was born at 22 weeks and five days. Amillia Taylor was born and survived at just 21 weeks, six days gestation. Frieda Mangold survived after being born at 21 weeks, five days – a full week earlier than Emery and Elliot. And Courtney Stensrud’s baby girl survived after being born at 21 weeks and four days gestation. She is now a healthy three-year-old who is alive because Stensrud’s doctor heard her pleas and decided to try and help the little girl. After her boys had died, Amanda was discharged from the hospital and given stillbirth discharge papers. Even though her boys had both been born alive and breathing, the hospital was not acknowledging it. Amanda filed an internal complaint with the Riverside Methodist. However, the hospital responded that they “consider the matter closed.” Now, she has filed a complaint with the Ohio Department of Health and hopes that others will support her efforts by contacting Riverside’s CEO David Blom. Baby Elliot was born premature and doctors refused to help him. Emery and Elliot aren’t the only babies who have died because doctors refused to help them. Last year in the UK, baby Autumn died after being born prematurely at 22 weeks and six days. 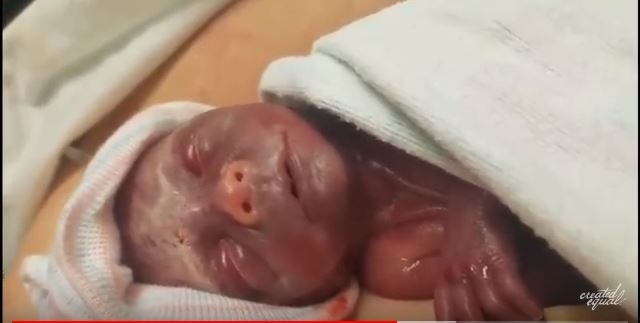 She lived for nearly two hours outside the womb, and despite the fact that she was “gasping for air” and “moving her arms and legs” doctors did nothing to help her. There is no justifiable reason as to why the doctors at Riverside Methodist Hospital refused to help Emery and Elliot. They had previously stated that they would only help the boys if they were born at 22 weeks and five days, but when it came down to it, they still refused to assist in saving the boys’ lives. Amanda had to watch her babies die and now must live with the question of “what if” for the rest of her life. Editor’s Note 3/19/19: Photos and links were added to this article as proof of the hospital’s actions and the deaths of the twin boys.